That is the picture that confronts you when THC is mentioned, and it probably makes you very wary of hemp oil with THC. This is especially true if you are no fan of recreational marijuana. However, this is only half of the truth. You will be shocked to learn that THC is used around the world to treat various ailments and that the patients are ordinary ‘clean’ men and women whose only interest is getting well. Think of THC as one of the many prescription drugs in stores around the country that are used to treat and manage conditions such as insomnia, stress, anxiety schizophrenia, bipolar disorders and many others. These tranquilizers, pain relievers and cough syrups help make lives of millions of people better and more productive. However, such prescription drugs are also abused and become addictive to many others. The point here is that hemp oil with THC, just like any other medicine at the pharmacy, if not used correctly can lead to negative results. However, if you use it in the right way, you stand to get only benefits out of it. But why should you even consider using hemp oil with THC? As compared to pharmaceutical drugs, hemp oil is not only effective but also less likely to produce side effects or result in overdose. The first one is in isolation as a remedy to such conditions as pain, nausea, vomiting and lack of appetite. This means that different useful cannabinoids in the hemp plant work better together than on their own. Therefore,CBD is more effective when accompanied by some THC. It is also important to mention that the CBD inhemp oil cancels out some of the side effects ofTHC. Unfortunately, hemp oil with THC faces many restrictions in terms of the law and regulation. It is not acceptable in many states to purchase, possess or use products that contain some amount of THC. However, most states recognize the medical need and have passed laws that allow doctors to prescribe hemp oil with THC to deserving cases. 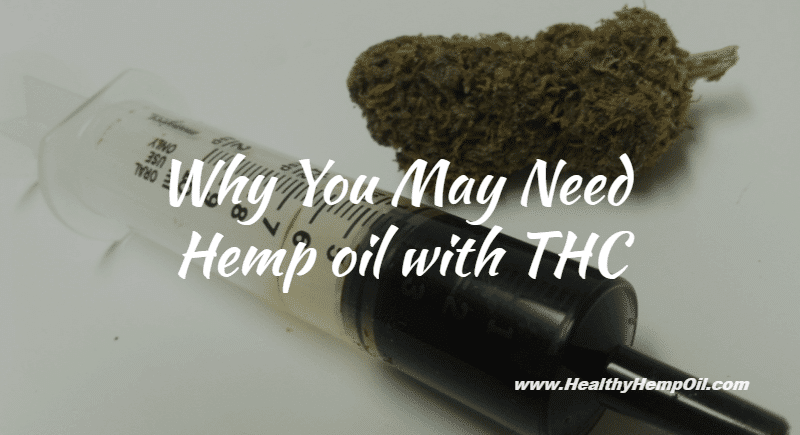 Therefore, if you have chronic joint pain or are undergoing chemotherapy treatment with unbearable body reactions, you have the option of talking to your doctor about giving you a prescription for hemp oil with THC. Nevertheless, this should be done with knowledge of the medical marijuana laws within the state in which you are making this request. Do you find it ironic that laws are strict on hemp oil with THC but lax on pharmaceutical drugs that are equally harmful when abused? Let us know what you think below. Cannabidiol Dosage: How Much Do You Need?